That lyric has been running through my head for several days now. If you check how long it’s been since my last blog post, you’ll know why. The line is from a Bob Dylan song, “Watching The River Flow.” Though it was released as a single in June of 1971, I’ve always known it as the opening track of the double LP set, Bob Dylan’s Greatest Hits, Vol.2. Greatest Hits, Vol.2 reached record store shelves on November 17, 1971. Seen by some at the time as being a “piece of product” whose release was perfectly timed for Christmas gift-giving, this compilation is something more. In the 2002 All Music Guide To Rock, Stephen Thomas Erlewine describes the set as “largely comprised of album tracks which became classics, either through Dylan’s own version or through covers” and gives it a starred, “Essential Recordings” rating. Here’s the track listing for side 1. Next comes vintage 1963 Dylan at his acoustic-guitar-fingerpicking, harmonica-blowing, Folk Singer/Songwriter best. Then comes slickly produced, almost crooning (is that voice really Bob??? ), recorded-in-Nashville Dylan from 1969 and finally: the newly-electric, 1966 Blonde On Blonde Dylan in all his image- laden, psychedelicized glory. Did I mention that this was a 2-record set? The collection ends with four more “previously unreleased” recordings. Side 4 finishes with re-recordings of three songs from Dylan and the Band’s yet-to-be-officially-released-but-already-legendary 1967 Basement Tapes sessions. “You Ain’t Going Nowhere,” “I Shall Be Released” and “Down In The Flood” are presented here in joyous, acoustic renditions that make me think that I’m listening to Bob and his friend Happy Traum jamming away on someone’s back porch up in the hills of Woodstock, NY, or somewhere. Recorded at Columbia Records’ Studio B in New York City, these performances were the result of a single afternoon session on September 24, 1971. Happy Traum contributes bass guitar, banjo, acoustic guitar and backing vocals to the tracks. The album jacket photos, by the way, were all taken on August 1, 1971 at the Concert For Bangladesh, an all-star benefit concert organized by George Harrison and held at New York’s Madison Square Garden. Dylan was the “surprize” special guest and he performed with a back-up band consisting of Harrison on electric guitar, Leon Russell on bass guitar and Ringo Starr on tambourine. 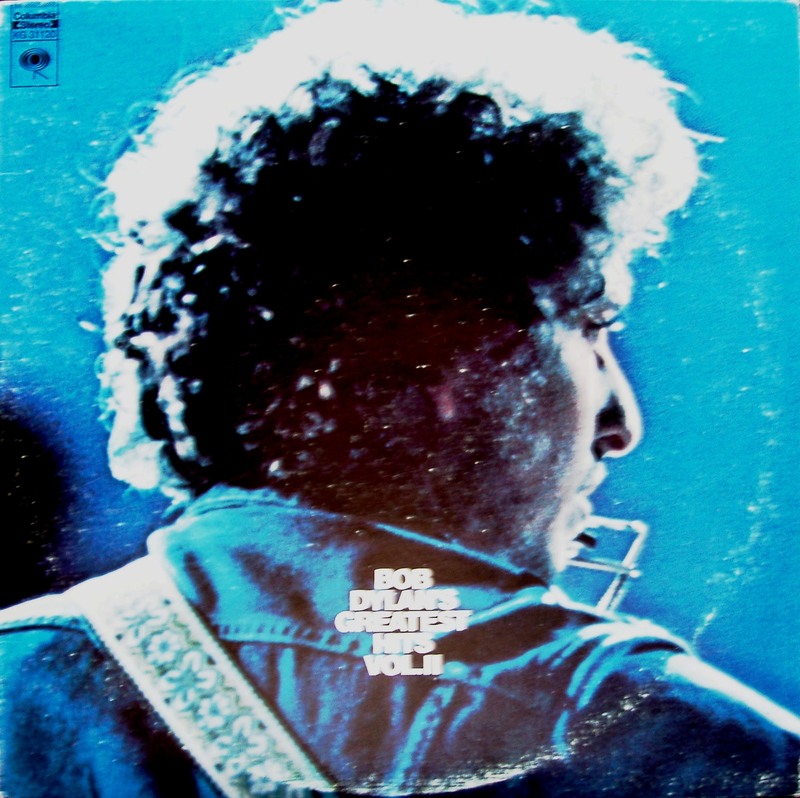 If I had to distill my CD/Record collection down to include only two Bob Dylan albums, I’d be quite happy for another forty years with Greatest Hits, Vol.2 and the first, single disc Greatest Hits. Music this good will never, ever get old. This entry was posted in Random Topics and tagged Bob Dylan, Bob Dylan's Greatest Hits Vol.2, Jesse Ed Davis, Records from 1971, Watching The River Flow. Bookmark the permalink.